On behalf of B’nai B’rith Auckland, we are delighted to invite you to their biennial event dedicated to the precious memory of former BB President, Steven Scher, to celebrate and reward excellence in Leadership in our Jewish Youth Groups. 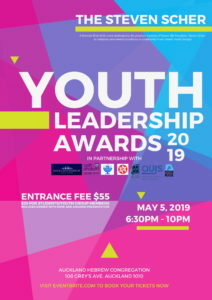 The Steven Scher Youth Leadership Awards Dinner will take place at the Auckland Hebrew Congregation premises, includes a fine meal, wine, a keynote speaker (Deb Levy), the Awards Presentation, oh and perhaps a little surprise!! This year, BB have widened the number of youth groups and asked each of them to nominate as many as 3 young people, who will then be selected by a panel. The 3 successful nominees will each receive a substantial cash prize from B’nai B’rith.